When the Fully Automatic AED Plus® detects a shockable heart rhythm, it delivers the shock on its own. No one needs to push a button. Once the Fully Automatic AED Plus prompts “Don’t Touch Patient,” and the heart analysis begins, if a shock is needed, it will be delivered automatically after a brief verbal countdown. 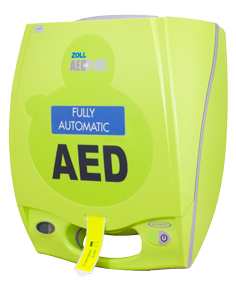 Like all ZOLL AEDs, the Fully Automatic AED Plus features Real CPR Help®. This revolutionary technology gives you real-time feedback for both depth and rate of chest compressions, helping you provide the best CPR possible in a rescue. Audio and visual prompts guide you to rescue with a confidence and clarity unmatched by any other AED.